Picture this: a digital photo frame that flashes memorable moments of your life . . . and how much electricity you use and what your monthly utility bill might look like. The unusual idea comes from startup Ceiva Energy, which intersperses photos and energy data to try to nudge you to conserve energy over time. Launched in 2011, the company is part of digital photo frame maker and photo service company, Ceiva Logic, which was founded in 2000 by former Disney executives and based in Burbank, Calif. The company has managed to line up pilot projects with utilities such as Glendale Water & Power, National Grid, San Diego Gas and Electric and Burbank Water and Power. Ceiva also has three additional customers but declined to disclose their names. Marrying a digital photo display with energy data is a bit of a wacky concept. Many startups (and big companies, too) have attempted to build dedicated displays and dashboards to present home energy use and energy saving tips, and have failed rather miserably. Part of the problem was that many of those devices were too expensive for what they offered, but also many average consumers just weren’t interested in the technology. Since then, we’ve seen the rise of more sophisticated thermostats, like Nest, that attempt to learn homeowners’ energy use patterns and can be programmed to automatically adjust the temperature settings to cut energy use here and there. Dean Schiller, CEO of Ceiva Energy (and Ceiva Logic), blames the failure of the home energy dashboards of yesteryear partly on poor designs that overlooked the importance of creating a good experience for average people, not just the tech savvy or the early adopters. It’s otherwise known in industry-speak as “customer engagement,” which utilities are caring more about — or they should — as they face growing competition from upstarts selling solar electricity services. Utilities in many states are also under regulatory mandates to promote energy conservation, so are looking into many new options to increase customer engagement. “In the energy and utility space, magic isn’t something that comes up often,” said Schiller, making a reference to his time at Walt Disney Feature Animation. Here is how Ceiva’s technology works: the photo frame, with an 8-inch screen, shows a montage of photos uploaded by the resident. The frame is Zigbee-enabled to receive energy use data from the home’s smart meter. All the data, including photos and meter readings, go to Ceiva’s servers for processing before being displayed in the frame. 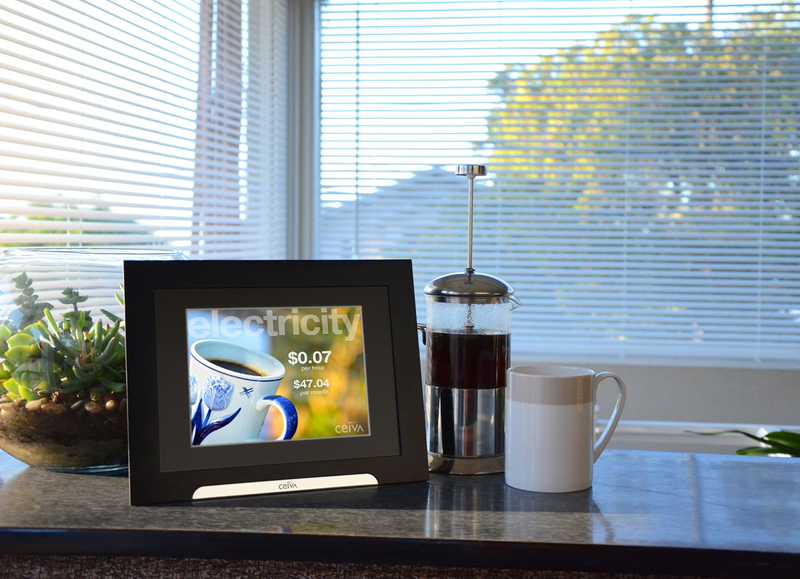 Every 90 seconds, the photo frame displays the home’s energy consumption data. But the data points are reduced to two or three numbers, not a chart or graph or a list of data points that simply spits out a whole bunch of confusing information. Instead, the photo frame shows, for example, the electric rate and an estimated utility bill for that month. The electric rate isn’t expressed in cents per kilowatt hour but in cents per hour. This difference is crucial, Schiller contends, because people largely don’t understand or care about what the term “kilowatt-hour” means. But they can grasp the idea of how much they are spending each hour. A third data point — how much money has been spent on energy use so far today — could also be shown. Finally, the frame also shows a stand-alone message that gives an energy saving tip. The same tip is broadcast throughout the day. For those who want charts and graphs showing hourly energy use and other details of their meter readings, they can get those data via the photo frame by manually selecting them and have a ball. For those who just have to check their energy use while they are away from home can do so on a smart phone app that Ceiva provides. Ceiva also announced on Thursday the results of a survey it conducted with the Glendale Water & Power customers that have enrolled in the pilot project, which began in late 2012. Glendale, located in Southern California, is Ceiva’s first customer, and the utility serves about 33,740 water customers and 85,360 electric customers. But the pilot project is small: 72 customers are in it, according to Atineh Haroutunian, a spokeswoman for the utility, which hopes to expand the pilot program to include more customers. The survey showed that 88 percent of the customers liked the way that Ceiva presented the energy data and energy saving tips. The display and energy data also prompted over 83 percent of them to think about what caused a rise in their energy use, Schiller said. But have those customers really saved energy and money? Schiller said Ceiva will release those results later. Ceiva makes money by selling the picture frames and charging subscription fees for designing how the data is displayed and for collecting and analyzing the data. Schiller declined to disclose the price for each photo frame, except to say that it’s below $100. Whether Ceiva’s approach will really modify people’s behavior over time is, of course, not yet known, given the company’s short history. But the use of personal photos to grab people’s attention and then use that to deliver energy conservation messages seems a novel idea from the more technical presentation of energy data in the past.